Riverbank is an exclusive new development of just 32 houses on a magnificent site overlooking Easkey River and the Atlantic Ocean, one of County Sligos most beautiful settings. This attractive and prestigious new development consists of 12 semi-detached homes and 20 town houses constructed round two aesthetically pleasing 'village greens" which enhance the tranquil environment. Accommodation in both style properties consists of a kitchen/dining room, sitting room, utility, guest w.c, family bathroom, 3 bedrooms with an en-suite bathroom, walk in wardrobe in the master bedroom. 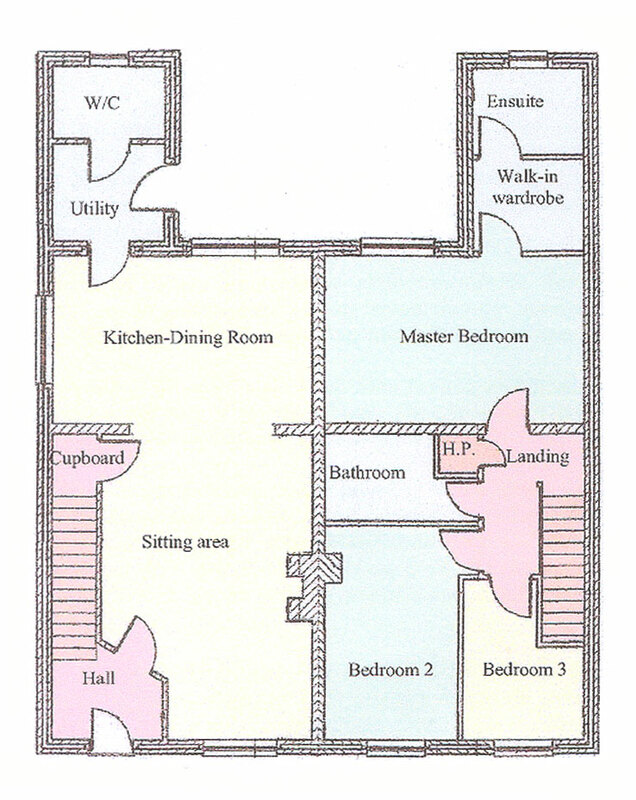 Total floor area is approx. 124.94 sq.m (1336.85 sq.ft). Easkey is a beautiful coastal village located in West County Sligo on the Atlantic Coastline. It is approx 16 miles from Ballina, 28 miles from Sligo City and 8 miles from Enniscrone with 5km of sandy white beaches and an 18 hole golf course and is accessible by Plane from both Knock Airport and Strandhill Airport. The Riverbank development is ideally located and well positioned at only 200 yards from the centre of the Village. 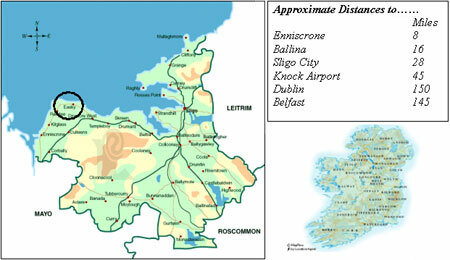 The Village is small but diverse, and has all the services and amenities that one requires in the 21st Century - Daily bus services, Primary and Secondary Schools, state of the Art Health Centre, Indian Cuisine Restaurant, a selection of both Traditional and modern Pubs, Butchers, Grocery Shops, Post Office, Churches (Catholic and Protestant) and a Surfing Tourist Office. 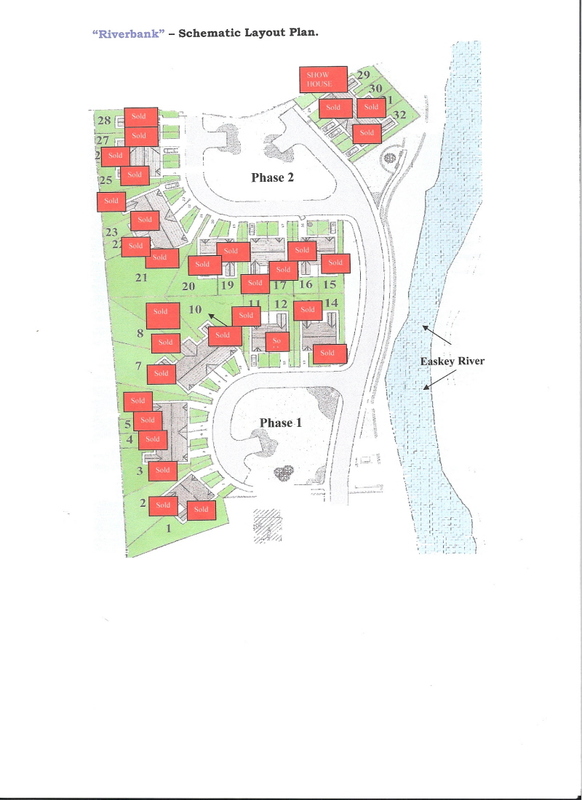 Private Fishing Rights - Every house in Riverbank comes with the rights to the Fishing on the River (Subject to a license being purchased from the Fisheries Board). Only residents of Riverbank can fish from the banks of the River on the Estate. Non-Scratch long life Amteego Wood Flooring, ceramic tiled above worktop, well appointed Solid Wood custom fitted kitchen, Stainless Steel Gas Range Cooker and Stainless Steel Extractor Fan, Integrated Dishwasher, Integrated Fridge/Freezer, Belfast Sink, Granite Worktop and Custom made Blinds. Non-Scratch long life Amteego Wood Flooring, Table and 6 chairs, Custom made Blinds. Ceramic tiled Floor, Fitted units, Tumble Dryer and Washing Machine. Non-Scratch long life Amteego Wood Flooring, Brown Leather 3 piece suite, Solid Wood coffee table, TV unit and Dresser/Drinks Cabinet, all Lamps and Light fittings, Black Slate Fireplace, Mirror, Pictures and Custom made Curtains and Blinds. White Sanitary ware throughout, bathrooms fully tiled wall and floor, Electric Shower, Mirror and Glass shelf. Carpeted, King Size Bed and Mattress, End Table, 2 Tall Lockers, Bedside Lamps, Large Dressing Table with Victorian Style mirror, designer Bedding sheets and throw, Custom made curtains and blinds, Fully fitted Walk in Wardrobe. Carpeted, Double Bed and Mattress, 2 Lockers, Bedside Lamps, designer Bedding sheets and throw, Custom made curtains and blinds, Fitted Wardrobe, Light Fitting. Carpeted, Single Bed and Mattress, 1 Locker, designer Bedding sheets and throw, Custom made curtains and blinds, Fitted Wardrobe, Light Fitting, Picture. Solid wood paneled interior doors. Multi-Point locking hardwood external front door and White PVC Back door, and uPVC double glazed windows. Attractive Stone Work finish to windows and doors. Boundary walls and fences are per planning. 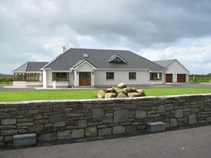 Luxury Showhouse with all Furniture, Fixtures & Fittings with uninteruppted views of Atlantic Ocean and Easkey River.